SOLUTEK INFORMÁTICA. TO SELL OR NOT TO SELL THE COMPANY. An afternoon of October 2011, Cristian Benavides, Juan Almanza and Marcelo Asprilla founders and owners of Solutek Informática Ltda. technology-outsourcing company analyzed the possibility of selling the company. It was about after two months of negotiations with an Arab investor, whom had offered to buy the company. The partners considered if they should take into consideration the offer made by the investor and decide whether to accept or reject the proposal. Business Project Solutek Informática Ltda. Is an organization founded in Bogotá, Colombia in 2008. The company was the owner of the SOLUTEK brand, whose purpose was to develop technology products and services for the business market in South America. 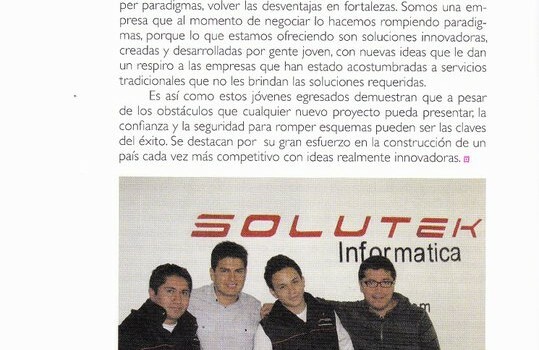 Solutek Informática was established on August 22/2009, with an initial investment of $2500USD and started its operations in February 2010 by Cristian Benavides Daza, Juan Camilo Bernal Almanza (Undergraduate Students of Marketing and International Business from the Sergio Arboleda University) and their partner and businessman Marcelo Pardo Asprilla. The different personalities in this company were complementary in being able to achieve a common goal. Cristian has been characterized as reckless with a futuristic vision, intelligent, impetuous and a dreamer, pursuing a realized project from his time in his undergraduate degree at the Sergio Arboleda University. Juan is a calm man, intelligent and methodical that gave a sense of balance to the society. The third participant in Solutek society project was Marcelo, who was characterized as risk taker, practical and without fear of challenges. Although, his only training and experience was the time his been working in his shop. 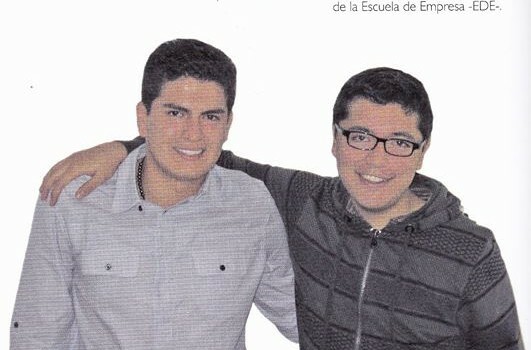 Cristian, Juan Camilo and Marcelo saw an opportunity in the technology market due to the overcrowding of technology as a necessary element for the competitiveness of organizations. Despite their business idea at first generated comments from experts in creating business plans that are “this project is not viable, without sufficient capital is not good to create a company” and “it would not be a successful project”; the partners decided to start the company in spite of the comments. Their business plan generated mixed reactions from relatives. People close to Solutek used to say, “they are completely mad they will fail”, and in contrast others would said, “We completely support the project”. According to the partners “it was worth the risk” and “bet on a dream” which in their opinion would be “the model for other people and small businesses that want to emerge in the country”. SOLUTEK brand was the result of the business project of its partners in the Fundación Crea Empresa del BID1 (Create Company Foundation IADB) and Sergio Arboleda University. From August 2009 and from February 2010, its founders were dedicated to create technology products and services for the business market in South America. Solutek was designed to be among the top global companies; for such reason all processes and ways of working were shaped long before the starting any operations. 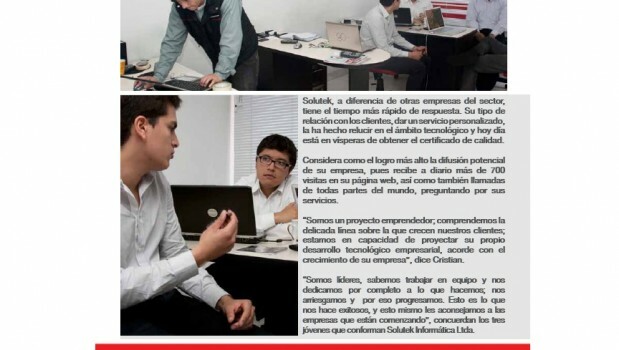 Although in the first two months of operation Solutek failed to generate any sales, the partners developed services which they said gave the following benefits to Solutek Informática: a great online reputation through its main website (www.solutekcolombia.com), procedures for information management based on high quality standards such as (ISO 9000) and a group of collaborators composed by the three initial partners and a systems engineer. 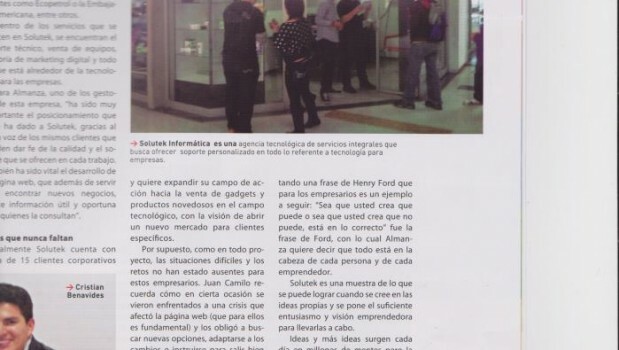 The generated service implementation lead them to be awarded with the “successful entrepreneurship Case” 2011 in entrepreneurial contest conducted by the Chamber of Commerce of Bogotá on 18 /19 November 2010. SOLUTEK INFORMATICA had been selected within the top 20 companies by the Bogota Chamber of Commerce, from 3,000 different listed companies. Around mid 2011 and after more than 1 year and a half offering services, Solutek Informática Ltda. was transformed into an innovative company with an average income of $12,000USD per month. A real marketing spending of $200USD a year, quotes of over $1 million USD a year with a conversion to sales of 14.4% and an average of 800 hits a day on their website. In its June 2011 profit and loss statement, operating revenues had increased by 400%, and the percentage of net profit increased by 62% compared with the previous year. In the balance sheet, total assets showed a growth of 51%, liabilities increased by 1808% and its equity increased by 50.55%. Moreover Solutek had the opportunity to have several businessmen from other countries (Uruguay, USA, Guatemala and Chile) visiting them, and reiterating that its value proposition was recognized internationally. The biggest challenge of the company had, consisted in building trust in the market, due to the lack of enough experience, and its partners did not exceed the 26 years of age. Even though, they managed to secure opportunities for multinational companies, projecting themselves as a reliable and robust company in the virtual branding. 1. All Colombians connected and informed. 2. Consolidation and institutional modernization to generate a strategic sector for the country. 3. Development and competitiveness of the ICT industry. 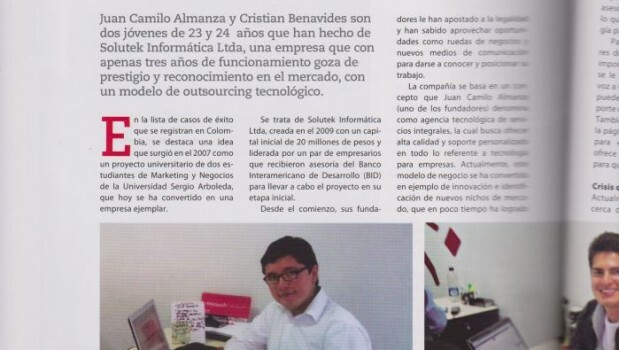 In this sector, that promoted business and economic development, was where Solutek Informática Ltda. conducted its operations. They were looking actively for other companies to use them as intermediaries to invest in ICT’s; in this way, they could help other companies to reduce their costs and increase their sales, and equally to fulfill its vision to be one of the most prestigious companies globally, contributing to the growth of emerging countries, especially Colombia. Added to the situation presented in the market, Solutek Informática Ltda. not only saw the opportunity of work in technology, but in business consulting for development and innovation in organizations. For Cristian Benavides “the above is reinforced taking into account that what drove the economic growth of the countries, were the major advances in important branches such the scientific, agricultural and technological product development”. Even so, Cristian considered “very few companies were working on this”. For that reason, Solutek Informática considered that “technology was an invisible circle intersected to all branches of knowledge, and that if they could build products and services working to aim of this, they would work to narrow achieve the gap of indifference to technology and economic development of the countries that remained in the emerging markets”. When Solutek began operations, the founders thought that even though the idea might seem very good, they were exposed to the risk of failure as many others, and actually they almost do. Things were not going as expected. They were not renting enough to sustain operating costs, and even Juan came to think to work in another company in order to help support the expenses incurred. Furthermore, in 2011 Colombia was just dabbling in the ICT market and large multinational technology industries were trying to make their way in the country. Solutek partners felt that the opportunity of a business project was based on the market need for something different that did not exist yet; with that they referred, to not only hire outsourcing for support and development activities but to go beyond and enter into activities and branches of companies in which the technology was quite precarious and yet unexplored at the time. Such was the case of optimization of processes using QR codes, development of management software that was anchored to the virtual marketing process and increase customer profitability by reducing the operating cost. According to Cristian Benavides, “the fact is that the company tried to innovate in everything it did and although it had much to learn, began the process, knowing that Colombia lacked incentive for this kind of undertaking; “Not just because the government does not help the entrepreneur, but also because there is a cancer call corruption that eats away society and damages young people’s ideas, disease that discourages entrepreneurship”. The competitors in 2011 came to affect so much Solutek Informática Ltda. to the extent that sales and the common services in the market were not possible, as it was sales in Hardware and Software. 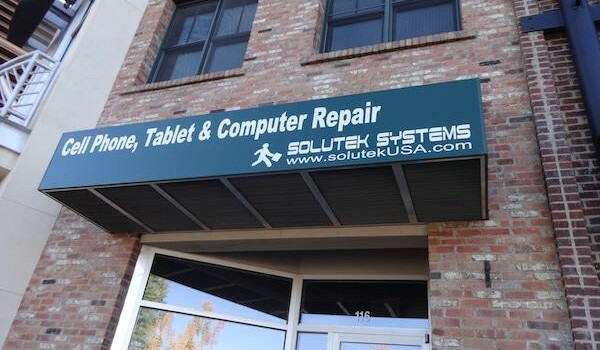 Its profits were 0%; the only thing that gave some financial growth achievement to Solutek were the services and products not offered by its competitors such as enterprise information retrieval, consulting on positioning, marketing consulting, innovation and development consulting technological leading customers to purchase new technology with a strategic goal offered by Solutek, among others. Solutek Informática was able to differentiate their products and services into three categories; the first was innovation and development, the second one was technology infrastructure and the third one was digital marketing, which was the most important growth strategy, not only for Solutek but also for the customers. The first category defined and advised technological strategy objectives for clients organizations to implement them in hardware and software technology provided by Solutek; the second was to ensure that the infrastructure could work synergistically, i.e. dial up networks, voice, data, wired and wireless power among others; and the third category, was the way in which the customer could increase demands for their products and services on the virtual market, so they could finance the implementation of the two categories mentioned above. The strategy of generate a differentiator value from its competitors generated for Solutek Informática an annual accelerated growth of about 71.43%, with a gain of almost 100% in sales without external funding. Given the success and growth of Solutek Informática Ltda. in July 29/2011, the company received an investment offer by (XXXXXXX), director of the (XXXXXXX) of Saudi Arabia and Secretary General of the Council of Chamber of Commerce and Industry of Saudi Arabia, who offered in first instance to participate in the company’s financial structure with the (XXXXXXX). Solutek Informática partners considered the proposal, and found themselves in a controversial situation; it was hard to believe they could receive an investment proposal without looking for it. Cristian Benavides asked: “would it be a real proposal?” “Who was that investor and why he wanted to merge with Solutek?”. All sorts of doubts and questions began to arise in each one of the partners, who had never in their plans and expectations contemplated selling or allow access to investors, much less foreigners. Juan Almanza wondered: “how far the company was projecting?” “What image was being built, not only nationally but internationally?”; “Why had we won a great reputation on the web in such a short time?”. Each of the doubts arisen until that moment had make them think that it would be a good idea to hear the proposal that such investor was making. However, in the first instance they preferred to abstain from giving an answer, but to first investigate who had made the proposal. The result was that Mr. Fahad was a businessman with experience and his proposal was real. During about a process of two months; in which the parts exchange emails and calls, and Mr. Fahad made an initial proposal to the company Solutek Informática. The first proposal was to make an investment of $100,000USD in exchange for a percentage share of 50% of the company. The members reflected on the implications of allowing a foreigner that did not know the internal situation of the company merged with them. Additionally, because they doubted whether “the sell the company could end their shared dream of running a prestigious and important business globally” and this could undermine one of the missions that were founded by Solutek consisting of “contributing to the development of emerging countries as Colombia”. Two months after the initial offer and with the lack of response from Solutek’s partners, the investor Fahad – Al Sultan made a new offer, which consisted of the total purchase of the company for the amount of $250,000USD under the condition that the company should continue be directed by the current members for a period of approximately five years. Cristian, one of the partners knew that having more capital, is having more support and allowed them to carry out processes of consolidation and growth of the operation. With this measure they managed to avoid losing huge business opportunities, as had happened on one occasion in which they let pass a contract with the Discovery Channel worth over $1 millionUSD and had not been able to realize due to lack of working capital. The other two partners Juan and Marcelo, for whom Solutek was also his plan of life, thought that this was a unique opportunity, so it could not be ruled without the proper analysis. The selling of Solutek represented to the partners a “higher economic achievement” compare to what they had achieved so far; even taking into account that the invested capital was only 1% of the money offered by the Arab investor. Such profitability would give them “economic peace of mind”; they would “create a new improved company, with enough capital to leverage high-scale projects” and “the experience gained so far would allow them to focus on market share still waiting to be explore”. Juan said, “create and maintain a company in Colombia is difficult because of the tax rates; and while in developed countries the tax rate paid by businesses was approximately 10%, in this country was around 33%”. The tax situation had generated stress on several occasions, and they tried to cover it with the profits made so far; not counting the other costs of the company. At the time of taking the final decision, Solutek was in a difficult situation; because if at first was difficult to analyze the possibility of accepting foreign capital to strengthen the business, now would be more difficult to make the decision to sell the entire company to an over seas investor. Although the offer was tempting, just to think that in such a short period of time since the founding it was worth much more the capital invested carried Cristian to say: “my idea is better if I built it, even more of what I’m being offered” ” We are doing things right” ” I do not want to give a dream, when I have not yet begun”. To know at that time if the company was worth or not the offer made by the Arab investor, was difficult to assess and did not offer much help to achieve best decision-making. The Solutek Company tried not to give too many details in its response to the investor. For two more weeks, the partners sought advice from consultants and experts business valuators, like Mr. Luis Alejandro Bernal; who said that it was too early to sell, because they had not operate more than a year and a half on the market and in addition Solutek Informática may have greater growth potential than the actual, and that they should have a greater knowledge of the investor. In October 2011, after two months of negotiations, the time to make a decision had already finished and they needed to respond to the over seas investor. Sell the entire company receiving a large amount of money or keep it and maintain the ability to receive any return on their possible future growth. Cristian, Juan and Marcelo, Solutek Informática partners wondered: should we sell or not the company?